Conditions: August conditions, High surface temps are causing the striped bass to hold deep. Offshore, the water temps are finally where they should be. Fishing Tactics: Fish the shallows during low light and then fish deep structure where the water is cooler mid day. My fly fishing tip of the week: August is tuff fly fishing but if you go early and work structure near moving water you can prevail... Sinking lines are a must. My spin fishing tip of the week: Use your fish finder to locate schools of striped bass in deep structure. 7 day outlook: IN shore: Hot and humid with afternoon thunderstorms. Stripers are now into a night feed so fish early and late. Off shore: Tuna are still a no show but it could happen any day now that the cold water has retracted to the east. Shark fishing is heating up and should be very good. Conditions: Neap tides of the past week are now behind us. Good flow and water temps in the low 80s will produce great conditions. Watch out for those afternoon storms though. Species to target this week: Snook, Redfish, Seatrout, Jack Crevalle, Ladyfish, Bluefish. 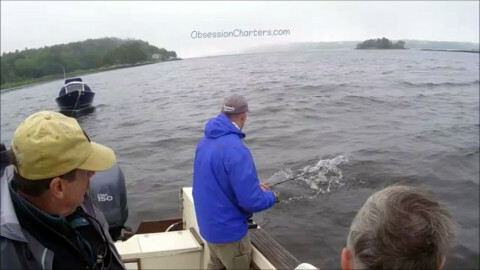 Fishing Tactics: Go early and blind cast the first hour or two of the incoming tide. Sight fishing will be good as soon as the sun gets overhead. My Fly Fishing Tip of the Week: White bait patterns are working on snook. Be prepared for follows and refusals if the strip is not correct. You have to tease the big’uns into biting. My Spin Fishing Tip of the Week: White and pink soft plastic twitch baits are producing snook. Root beer is the redfish color of the week. 7 day outlook: A lack of weather fronts in the 7 day forecast will provide a steady barometer and light winds. There are a few snook on the beach and some tarpon in Pine Island Sound. Lots of white bait around too. Snook, trout and jacks are on the backcountry flats. Fellow Registered Maine Guides; Carroll and Lila Ware from Fins and Furs Adventures in Skowhegan, Maine fished with me for 3 1/2 days last week. 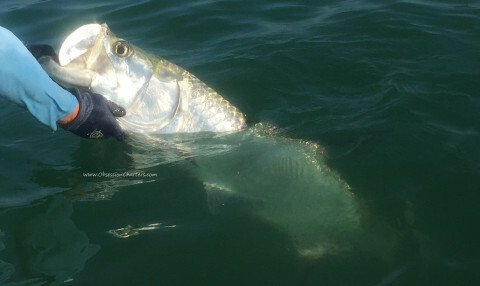 We spent three days tarpon fishing in Pine Island Sound and along the beaches of Sanibel and Captiva Islands. We spent their last morning here doing some inshore sight fishing for snook and redfish in the Matlacha National wildlife Refuge. We were off the water in just enough time for their flight. Great seeing you both again Lila and Carroll, wishing you safe travels home.